Rothdean Limited, a family run UK based manufacturing Company established since 1972, having expanded to its present size, we now employ a skilled workforce of over 50. The Jones family have been involved in the haulage industry since 1923, originally transporting mainly coal from the Forest of Dean coal fields and later steel from South Wales to nationwide destinations. At the introduction of articulation in 1959, the family commenced manufacturing trailers for their own use. Following the demand for trailers from local hauliers it became obvious there was a gap in the market. In 1972 Rothdean Limited was established by the current directors and brothers namely John and Lionel Jones. The brothers designed and produced the first step frame monocoque tipping trailers in the UK, which was rapidly copied by competitors. 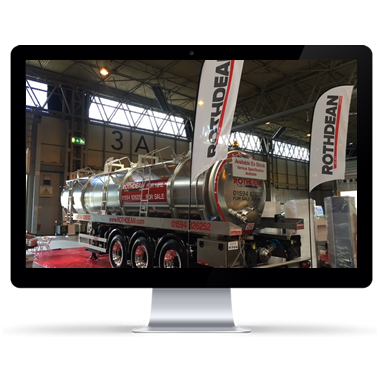 Rothdean Limited have continued and expanded the manufacturing business alongside the used heavy commercial vehicles sales. Aluminium bulk tippers for animal feeds, apples, potatoes, grain and offal industries. Aluminium aggregate tippers to carry sand and stone for the quarry industry. Steel bulk tippers for the steel, waste and scrap industries. Utilising the latest performance steel technology we construct in house a high strength lightweight chassis for all our tipping trailer models. 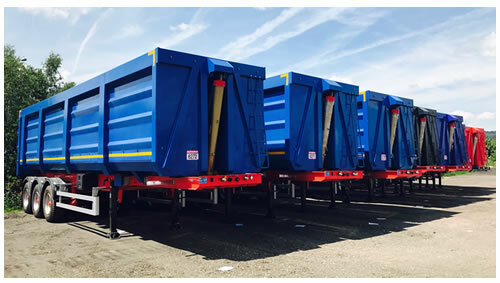 These are all finished with market leading components: axles, tipping ram, weigher, ABS, lighting and sheeting systems allowing the customer to specify their unique requirements. Rothdean also offer an extensive range of transport related products and services tailored to our customers' requirements, ranging from new and used vehicle and trailers, with sales, leasing and hire packages to full repair and modification after care. Rothdean can be seen nationwide via our wide range of hire/leasing vehicles and trailers. We have a pool of over 250 vehicles, trailers and plant available for sale, long or short term hire or lease options either plain or in customer's delivery. Our hire fleet offer an extensive range of new and used trailers for the haulage and logistic industry to include mainly Tippers, Moving Floor and Tanker trailers to include Vacuum, General Purpose, Food and Milk Tankers. Not forgetting Lowloaders, Curtain siders, Flats, Skeletal, Refrigerator and Box trailers. Rothdean currently operates from three sites in Cinderford, totalling some 46 acres and have a dedicated workforce of over 50 personnel. In 2015 Rothdean constructed and moved the main offices, repair and maintenance work shop into a purpose built 3000m2 building. In addition to this we have also a separate manufacturing facility of 4000m2. 2016 has seen the opening of a new paint shop and the instillation of a robotic welder increasing the speed of production satisfying the demand of our well established and growing customer base. Rothdean is actively involved in providing 100% service to all aspects of the transport industry. We maintain a loyal customers both in the UK and worldwide, ranging from owner drivers to blue chip companies. Many vehicles are purchased direct ex fleet, repaired, refurbished and painted to the customers' requirements. Our used truck and equipment sales desk turnover circa 600 items per year ranging from 1 ton compact Municipal road sweepers to 80 ton heavy haulage Tractor units and virtually everything in between. With over six decades of expertise and experience we understand the unique and specific requirements and operational needs of each of our customers. Whatever kind of transport solution you are looking for, look no further than Rothdean Limited. We aim to offer our customers a bespoke 'one stop shop' service.